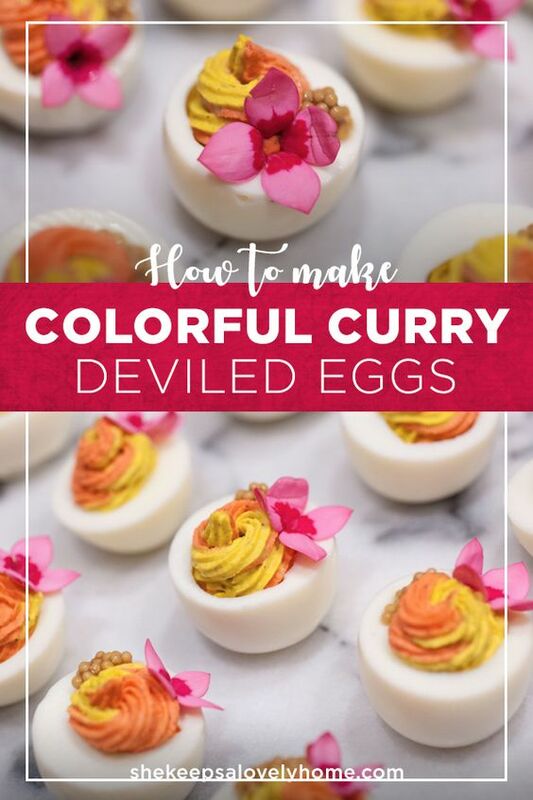 These colorful deviled eggs with curry have a mustard caviar garnish and an enchanting, tropical flair! I like adding elegance, most of all, in places where you regularly might not find it – like deviled eggs. I love finding new ways to tastefully theme my food for parties. I’m not the kind of gal that serves bloody eyeball-looking food for Halloween (although I love that stuff at other folk’s parties), or green beer at St. Patrick’s Day parties. I’m always looking for how to add a little elegance to a table, no matter what kind of event it is, because I think it’s rare and I know how much I appreciate it when people create beautiful things and share them with me. I find the perception of an elegant deviled egg may be one with a perfectly placed single chive, or one that is garnished with lobster or other luxurious ingredients. Indeed, these garnishes can be quite elegant, but I like to dress deviled eggs like they’re the bell of the ball. I like to give them character. I want to make them the center stage of an appetizer array, with not only lovely ingredients but a flamboyant design too. It’s just fun to do. I used a few bright, tropical Bouvardia flowers from my garden to garnish these little beauties and added a teeny bit of natural die to one of the ribbons to give it that lovely peach-orange color. 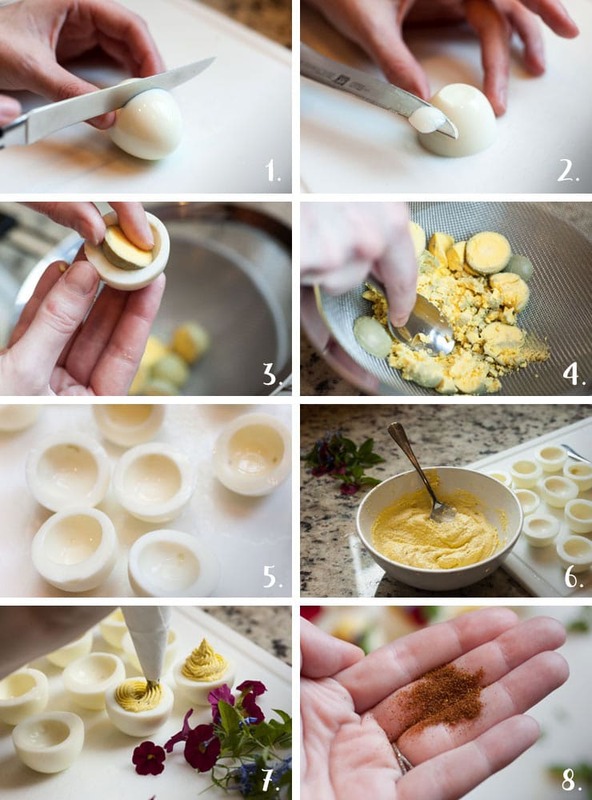 If you’d like to see how to make a two-toned deviled egg, take a look at this page first. If you’d like to add mustard caviar to your eggs, here’s a recipe for how to make it yourself! It’s one of my favorite deviled egg garnishes, and it couldn’t be simpler to make! 8. When garnishing with a spice or seeds, pour a bit into your hand first and use your fingers to gently sprinkle. Otherwise, if you pour directly from the bottle, it’s very likely too much will come out at once, and you’ll end up with a deviled, over-spiced heart break. You’ll require a pot, mesh strainer and mixing bowl for this recipe. You’ll also require a pastry piping bag and tip if you want the pretty two-toned ribbons. Mix in 3 tbsp. of mayo and 3 tsp. brown spicy mustard into your egg yokes. Add the ingredients carefully, making sure your consistency is not too runny, and not too thick – a consistency like hummus. If it’s too thick, just add a little more mayo. Separate your filling into two bowls, equally. To one bowl of filling, add 1 tsp. curry and 1 tsp. of stone ground mustard. All curry powders have different strengths so start with a teaspoon and add more if you think it needs more flavor. If it begins to thicken up with the spice, simply add more mayo and mustard so the consistency matches your other bowl. To your other bowl, add a tiny drop of natural dye. I used a pretty peachy color, but you can choose any color you want! Lay down two pieces of cellophane on a flat surface and and spoon filling onto each. Roll them up so you have two tubes of filling. Snip the ends. Place both of your tubes into a pastry piping bag, and squeeze into your egg halves. 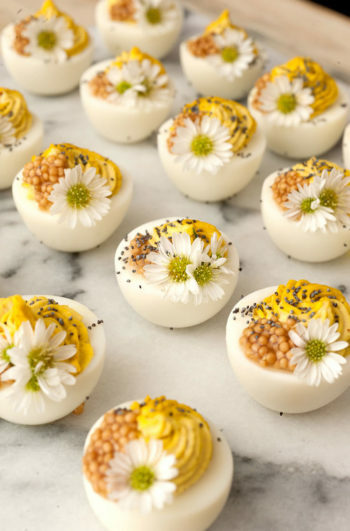 Garnish your eggs with flowers, and mustard seeds if you have them, and look at the lovely little eggs you’ve made!